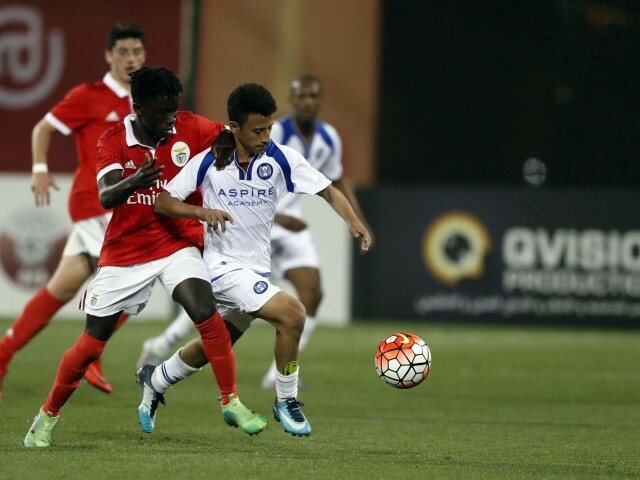 Benfica produced a stunning second-half comeback against Aspire Academy on an evening of high drama at Al Kass 2018. Two goals down at the break, an inspired double substitution changed everything as the Portuguese scored five goals in a devastating 16-minute spell on their way to an astonishing 7-3 victory. With the last play of the game, Aspire prevented being knocked out of the tournament with a goal by Naif Alhadhrami, which secured progression to the next round thanks to the goal difference. Benfica had made eight changes from their first game, while Aspire made four. Hugo Nunes, scorer of what was arguably the goal of this or any other Al Kass tournament in the Portuguese side’s opener against Guangzhou Evergrande, was among the substitutes. Aspire conjured an early chance when Fahad Al-Abdulla latched on to a bouncing ball in the area, but his snatched shot went narrowly wide. It was a confident start from the home side, and on five minutes they took the lead. Naif Alhadhrami picked up the ball on the edge of the area and, after taking a touch, unleashed an unstoppable drive into the top right corner. Despite this early setback, Benfica retained their positive approach and almost levelled three minutes later when Nuno Cunha’s rasping drive was well saved by Aspire keeper Mahmoud Abunada. The chances kept coming, and Mekki Tombari almost doubled the Academy’s advantage after cutting in from the left and spanking a low shot that Benfica stopper Dario Caetano just managed to turn round the post. Having fired off a warning shot, Tombari went one better on 13 minutes when he was set free through the middle and slotted home an expert finish to put Aspire 2-0 up. Benfica, so dominant and self-assured in their previous rout of Guangzhou, were suddenly rocked back. Aspire had undoubtedly brought their A Game to this clash, their skilled approach play defined by poise, purpose and pragmatism. On 40 minutes, the local team once again had Abunada to thank when he produced a smart save to deny Tiago Araujo, who had cut in from the left and fired a stinging shot that looked a certain goal. At the start of the second period, Benfica coach Renato Paiva made a double switch, introducing Jair Tavares and Goncalo Ramos to the action. The substitutions had an instant effect on the Portuguese, who created several chances in quick succession. Tavares had been the side’s linchpin against Evergrande, and he immediately sought to get on the ball and advance down the left. In the 49th minute, Benfica pulled a goal back. Tavares jinked down the wing before cutting the ball inside to Nuno Cunha, who teed up Ramos to provide a first-tine finish. The most astonishing recovery in Al Kass history was underway. It was all Benfica now, and they drew level on 52 minutes when Ronaldo Camara’s smart backflick deceived the Aspire backline and played in Cunha, who planted a low shot past Abunada. Implausibly, the Portuguese side went ahead on 57 minutes when Rafael De Brito latched on to a deflected free kick to volley the ball first time into the bottom right corner. And, astonishingly, they added a fourth with the very next attack when Ramos cut inside his marker and powered an unstoppable drive into the top corner. Four goals in nine incredible minutes had completely upended the course of the game, and Aspire were suddenly in a fight to regain their composure. Their task appeared even more difficult when Nunes was introduced from the bench on 63 minutes. Benfica added a fifth moments later when De Brito embarked on a powerful run from his right back berth before delivering a cross that flew over Abunada and straight into the net. With 20 minutes remaining,, Nunes picked up the ball midway inside the Aspire half and set off on a mesmerising run that left a trail of defenders in his wake. He seemed certain to score another goal of sumptuous quality, only for his shot to go just wide of the right-hand post. But moments later, a sixth goal duly arrived for Benfica, when Gomes hammered home from ten yards. And, on 85 minutes, the rampant Portuguese added a seventh. De Brito was set free down the right, and he cut back for Ramos to fire home and complete his hat-trick. Suddenly, from a position of relative safety, Aspire faced elimination, with a goal difference that was now inferior to Evergrande’s. Five minutes of added time were signalled and, amazingly, with the last touch of the game, Alhadlhrami powered home a header from a corner on the left to salvage the Academy’s hopes of further progress at Al Kass 2018.